Along with mobile phones voice activation and GPS, now Alexa and Siri are changing the way we search for services, including car oil changes. Searching for a service we provide, such as Oil Changes, while driving and making a query on your cell phone now accounts for more than 50% of the traffic to our website. And usually, the top few entries in the search is the service provider selected, provided their Google Reviews are respectable. So how do people find us? "Alexa, where's the nearest oil change place near me", or "Siri, where can I find an auto repair shop that performs oil changes near me?". All by voice. While driving. So we've worked to make our website show up in those types of searches and give you the information you need to select a quality, comprehensive, and cost competitive oil change for your vehicle at Callaway's Automotive at 5832 Davis Blvd in North Richland Hills (NRH) Texas. We're open 7:30am to 5:30pm Monday through Friday. You can see more of our pricing and oil change information at this Oil Changes Near Me link. We look forward to meeting you and serving you soon! Bob's '89 Buick had been to two other shops and they said it was either gonna cost him $300 or $600 depending on what they found. Looking for another opinion he dropped off his Buick and waited for our call to let him know if it was gonna be $300 or $600. 10 minutes later we called and asked him to come pick it up and bring $11.62 to pay his bill in full. Bob asked incredulously, "$11.62? That's all?" "You could have called me tomorrow afternoon and charged me $300 or $600 and I wouldn't have known the difference", Bob said. But that isn't how we do business. This was Bob's first visit to our shop. That was in 1998. Over the past 18 years we've maintained all of Bob's cars. And his wife's. And his children's. We earn our customer's business for LIFE by trying to treat them right EVERY time. Family owned and operated. Old school values. Call us. We can help! (817) 485-8189. Or stop by anytime Monday through Friday 7am to 6pm. It's time for our annual "Two Cans for 10%" food drive! This canned food drive helps a local church stockpile a pantry to minister to some of our neighbors in our community. We will run this opportunity until Friday December 18th. The event simply asks for each customer to bring 2 canned good items in and receive 10% off their ticket at checkout. And then at the end of the canned food drive, we match all the donations with our own, pile them in the truck and take them down to the church. The combined donation is usually hundreds and hundreds of canned food items. Which goes a long long way!to participate with TWO CANS in our event to support our neighbors. After 17 years with Callaway's Automotive, Mark and his wife are relocating to Lubbock to be closer to their Children and young Grandchildren. Hard to blame them! We are expressing appreciation for his service with a "send off" BBQ Luncheon celebration on Friday September 4, 2015 from 11:00am - 1:00pm. We invite you to drop by, say hello, and enjoy a BBQ Plate Lunch at the Shop! And while you're saying "goodbye" to Mark, we also invite you to say "hello" to Bruce. 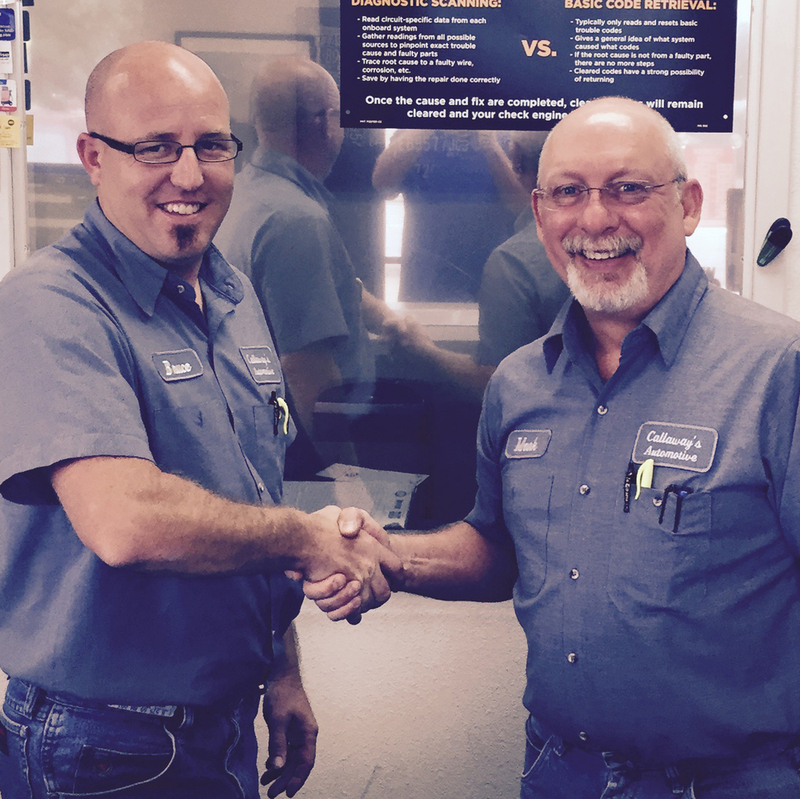 Starting while still attending Haltom High School, and after working for nearly a decade at Callaways' Automotive for Carl, Bruce accumulated nearly another decade of wide ranging automotive repair experience in other repair and diagnostics companies before becoming our General Manager earlier this month. We look forward to Bruce's day-to-day leadership at Callaway's Automotive demonstrating the same high level of commitment to each of our customers that you've come to know over the years, as we continue to strive for world-class service excellence. Won't you drop by, say hello, and enjoy a BBQ Plate Lunch at the Shop? We look forward to seeing you there Friday September 4, 2015 from 11:00am to 1:00pm. Click, click, click . . .
Or sometimes a slow crank and grind. You know something's not right with the electrical system and either it doesn't start, barely starts, or stubbornly starts. And once started, you're reminded that something is wrong by the persistent red light on the dash. You've got an electrical system that needs service. And we can fix that! There are usually four (4) areas of your vehicle's electrical system which need maintenance or repair: (1) Battery, (2) Alternator, (3) Starter, and (4) Fuses/Switches/Shorts. We cover each one of these areas of service at our Electrical Services page and you'll want to remember this page when you hear "click, click, click"! We all know that the #halftimeshow is most year's Super Bowl main event. That's where the razzle dazzle and fireworks combine to create a usually very forgettable spectacle. Some people call it music. Mostly we think it is not. Truly forgettable. Click the Play Button above to hear our #halftimeshow . . . Sometimes we receive reviews and testimonials that make us pause in appreciation and thankfulness for what wonderful customers we serve. We're humbled by such kind and generous words of affirmation and are so very appreciative for the opportunities you've given us. Thank you! One of our customers, David, caught the spirit and brought 4 CASES of canned food instead of just 2 cans when we did a big project on his vehicle. Wow! Last week we wrapped up our 21 day 2014 Food Drive with a pickup truck bed FULL of non-perishable food and supply items. What a wonderful way to help celebrate our abundance! We delivered the food to a local pantry to help serve our neighbors in need (NRHBC). Not annually, but for many years, we've created an event called "TWO CANS for $10". This canned food drive helps a local church stockpile a pantry to minister to some of our neighbors in our community. The event simply asks for each customer to bring 2 canned good items in and receive $10 off their ticket at checkout. And then at the end of the canned food drive, we match all the donations with our own, pile them in the truck and take them down to the church. The combined donation is usually hundreds and hundreds of canned food items. Which goes a long long way! This year we wanted to do more. More for our community, and more for our customers. So, we're offering "TWO CANS for 10%". This will give our customers a larger discount for more extensive work that might be needed on their vehicles. And perhaps, it will give more incentive to participate with TWO CANS in our event to support our neighbors. When your car is drifting between lanes and pulling to one side of the road, it requires constant vigilance and pressure to maintain a true track. One distraction or one inattentive moment and any number of unsafe situations can develop very quickly when all of a sudden you're in another lane or perhaps where there is no lane. We've discussed how front end alignments save you money by decreasing the wear on your tires and on your steering and suspension system, but in addition to the savings, we can not over emphasize the impact a front wheel alignment has on general motoring safety. At our Callaway's Automotive Davis Blvd location, we perform front wheel alignments on our laser Hunter 811 alignment machine to ensure an accurate, precise, and consistent alignment on your vehicle. Call us, we can help! Are your tires wearing out faster than you think they should? Is your car only pulling a little bit? Do you have to keep your hand on the wheel all the time? Do you have to apply a bit of pressure to keep your vehicle centered in the lane? If you answered yes to these questions, each and every day on your way to and from work you are spending a little bit of money that you don't need to. And after several weeks and months, that "little bit of money" adds up to a new set of front tires! Several hundred bucks! That you could have saved. . . . with an alignment. Front wheel alignment is an art and a science. It starts with knowledge of trained mechanics and proper diagnostic and correct equipment, like this Hunter 811 Alignment Machine. The reasons that cause a need for a front wheel alignment come in two main categories: (1) normal wear and (2) shock/impact. 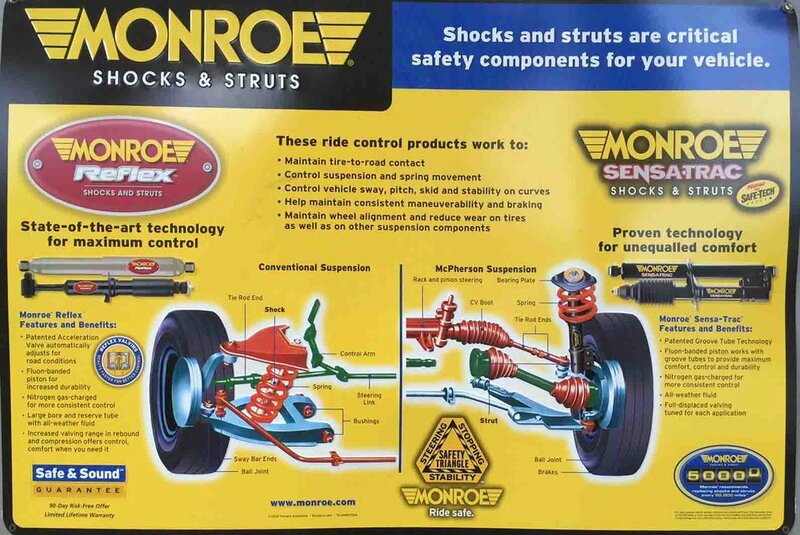 In the case of normal wear, over time and normal driving conditions parts wear out and tolerances are then exceeded in bearings, linkages, shims, bushings, and joints which then cause connections to loosen ("play"). When these connections loosen, or get warped out of tolerance, then the rolling wheel no longer tracks true and straight. This causes you to apply pressure to the steering wheel to keep your car centered in the lane. And it is this constant pressure that creates undue wear on your tires and on your steering linkages system. For example, we've seen tires wear out 2 to 3 times faster than normal because of being out of alignment. Thats a lot of money! In the case of shock/impact, the need for a wheel alignment is more obvious. Right after hitting the curb, or running through a pothole, you may notice "lane drift", and having to apply pressure to keep your vehicle centered. In this case, the steering and suspension linkage system components may not be worn out, but rather, just need to be adjusted to account for the shock (eg. slightly bent linkages, etc). But again, tires will wear out just as quickly as though it were a result of normal wear. Either way, a front wheel alignment is needed as soon as possible if you want to avoid spending more than you need to on tires. And we can help. Please consult our front wheel alignment services for more information. Cheap Brake Repair: Why it matters Who repairs your Brakes! When it is tempting to search for the cheapest brake job, consider what your brakes do to protect you and your family! 3 Reasons why Brake Pads matter? Think about it for a minute: when it comes time to replace your brake pads they'll last anywhere from two to five years, depending on how much and how hard you stop. And there are times when you need to stop hard and fast! Can you trust your brakes to perform for you when you need them? 1. Brake Pad's Heat Resistance. Brake pads press against the rotor when the brake pedal is pressed. This pressing creates a friction that brings the vehicle to a stop. That braking friction creates heat, and heat is the enemy of brake pads. In a semi-metallic brake pad, something like steel wool is the main component (up to 60%) which dissipates the heat from braking action. Therefore, the heat resistance and heat dissipation of the material that makes up the brake pad is critical to the long term performance of your brakes. Put simply, the material must hold up to friction and heat in order to be effective over the course of the brake pad's life. Brake pads come in three main materials: (a) Ceramic (b) Organic (c) Semi-metallic. They each have their virtues, and each vehicle's manufacturer recommends a particular pad for each different vehicle that they make. Their recommendation takes into account the brake pad's engineering to withstand and dissipate heat, for long periods of time, brake quietly, resist "glazing over" under high heat and pressure, and have a long wear life. We consult the manufacturer and use the brake pads that they recommend, not cheap substitutes. 2. Brake Pad's Quality of Life. A brake pad will typically last 30,000 to 100,000 miles depending on how hard and how often you are braking. That translates into 2-5 years for most drivers. Over that many miles, you want a quiet brake and an effective brake. 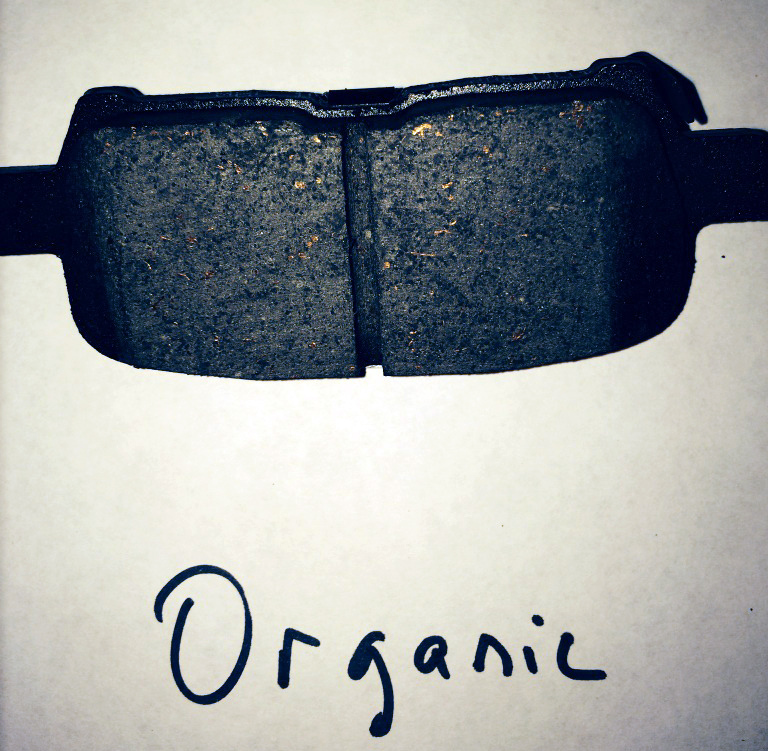 This type of organic brake pad is sometimes found in older vehicles, and either a semi-metallic or ceramic brake pad will provide upgraded performance, generally. Brakes that chatter and squawk are annoying. Brakes that "glaze over" under duress are dangerous. Installing cheap or incorrect brake pads often result in both annoying and dangerous situations, depending on the vehicle they're installed upon and the intensity of braking action. When the wrong brake pads are subjected to high heat for extended periods we've seen them glaze over to a high sheen which reduces their physical properties causing ineffective braking action between the brake pad and the rotor. In other words, when the brake pads glaze over, they won't stop your vehicle as quickly or smoothly. This is another reason we use high quality manufacturer recommended brake pads. 3. Brake Pad's Life Expectancy. This last point is an intangible, "unproven" observation over our many years of maintaining and repairing brakes. But if the manufacturer recommends several different brake pads of different core materials, we think Ceramic brake pads last longer than any other type of brake pad and we'll use them. Roughly 80% of the stopping energy on new model vehicles is engineered for the front brakes. That's a lot of heat and pressure on your front brakes and we want to ensure our customers receive good value for their maintenance investment . This is yet another way that, when we have a choice, we have confidence in ceramic brake pads . . . they just last longer (we think)! High quality Ceramic brake pads are often recommended by vehicle manufacturers as an upgrade, and we generally use this higher quality product on our services. In summary, using the manufacturer's suggested high quality brake pads adds about $20-$30 more than the cheaper brake pads, but given the long life and the vital importance of being able to stop quickly and correctly, we believe the $5-$10 per year of "extra" cost would be foolish to forego when it comes time to replace your brake pads. Therefore, unlike many "cheap brake repair shops", we use branded high-quality brake pads instead of a "no-name" brake pad. We think brake pads matter! If we can assess your vehicle's brakes, or help you with additional information to assist you as you make vehicle maintenance decisions please feel free to give us a call at (817) 485-8189 and ask for Bruce, our General Manager: he will be happy to help! We're all busy. Going to work, running the kids to practice, stopping by the grocery store. It never stops. 1. Pulsing Brake Pedal Syndrome: You're coasting to a stop on Davis Boulevard, applying light but increasing and steady pressure to your brakes and you notice a pulsing sensation coming through the brake pedal. In rhythm. This is not normal, and usually is an indication of a warped rotor (the rotor is the shiny metal disk that the brake pad presses against to create friction and cause the wheel to stop turning). This means the rotor must be repaired by resurfacing it on a lathe, or if the rotor is too warped or too thin to resurface, it must be replaced along with new brake pads. Uneven braking caused by warped rotors can be hazardous in all stopping maneuvers and this condition should be addressed as soon as possible when detected. 2. Brake Squealing: You first noticed it when it was warm enough to "roll" your windows down. At first you thought it was that clunker in front of you on Highway 26, but when you turned down your residential street and all the neighbors who were out watering their lawns were staring at you, it became clear that horrible squealing sound was coming from your vehicle. And then in the morning on the way to school the kids asked to be dropped off two blocks away because they didn't want to be embarrassed by that loud squealing either. So now that they have your attention, the brake squealing is caused by indicators (like sensors) that "know" when your brake pads are just about worn out. This brake squealing is your 'early warning' system telling you to get your brakes replaced very soon . . . probably within the next week or so: before anyone else is embarrassed when a certain vehicle can't stop and runs into the bosses' bumper in the employee parking lot. 3. Brake Squawking: This sound is usually noticed in the morning when backing out of the driveway. Its the first sign that some things are rubbing against each other that shouldn't be! It may be brake dust in the drums, or it might be glazed over pads from an overheating that occurred during particular hard stopping (or riding the brake pedal). Any further delay, and instead of just replacing your vehicle's brake pads and resurfacing the brake rotor, very likely there will be a more extensive maintenance and repair task including other parts replacements and possibly a rotor replacement. If addressed today, this problem can be prevented from being a dangerous driving condition and an expensive repair. 4. Mash on the Brake Pedal to the Floor Syndrome: It happened with little or no warning. Red tail lights were stacking up on the way home from work and it was time to stop on Northeast Loop 820, but when you pressed on the brake pedal it felt like you were stepping on a plum. And it went splat. Flat against the floor. And perhaps you got stopped in time. Barely. This is your brakes getting your attention because there's probably a leak in your brake lines or a leak or bypass of the valves in your master cylinder. The reservoir holding your brake fluid could be low (or empty). This is when you get some brake fluid into the reservoir and pump up your brakes and get straight to the shop. Or . . . if that doesn't give you any stopping power, call a tow truck and get your vehicle delivered to the shop. The leak will have to be found and the source repaired. Its probably the master cylinder. This is a problem that obviously can't wait to be repaired! Brake lathe resurfacing rotor while on vehicle gives truer surface for longer brake life. 5. Brake Pedal Hard as a Rock Syndrome: You came to a stop on Grapevine Highway, but it was like you were on an old tractor and had to jump on the pedal to get any response. You mashed hard and nothing happened until you mashed harder. When this happens, your brakes are getting your attention because they may be hissing and that sound indicates that there may be a problem with the vacuum brake booster. There is likely a leak in the system and will have to be found and repaired right away. 6. Brakes Grinding Syndrome: Metal-on-Metal gnashing and grinding. Brake pedal shuddering. Groaning and gashing sounds as you come to a stop, maybe. This is what happens when you've ignored all the other signs that your brakes were begging for your attention. Now its hazardous to driving and expensive to repair. Brake pads, Rotors, and perhaps any number of other component parts are all likely in need of replacement. Today. This list illustrates why it does not pay to ignore your brakes. Brakes are a routine maintenance item that literally should be looked at every 30,000 miles. They may not need repair or replacement that frequently, but they do need to be inspected for wear at least that often. There's too much at risk. For you. For your family. For others who share the road with you. Stop by and let us take a look at your brakes before its too late! Why does it always seem to happen at the worst moment? Half-way to Padre Island, or Wolf Creek Pass, or in other words....in the middle of nowhere. Even out of cell phone tower range. Often after dark. At the mercy of strangers and passerby's. J. and any dash warning lights that may have come on. Since we look at thousands of vehicles every year, we can quickly and professionally evaluate the condition of your car's systems most likely to break on longer journeys. And if they need maintenance or repair, we know how to do that too! Of course, maintaining your vehicle on a regularly scheduled basis, including oil changes, brake servicing, and filter cleaning/changing will help increase the overall reliability of your car as well as increase the long term value of your investment. It only takes a moment to heed these few simple and quick words of advice to help you maximize your vacation time, and minimize your risk and your worries! Call us for an appointment at 817.485.8189! As we enter the election cycle and with it, all the debates, when it comes to servicing your vehicle just ask yourself this one question; "Are you better off now with our service than you were before with whomever previously serviced your vehicle?" We've been blessed to be a part of this community for 28 years. Growing with it, serving it, sharing it. Join us as we give back a bit by contributing to the Need Food Pantry of Haltom City which is supported by many churches in our neighborhood. You've got to ask yourself one question: 'Do I feel lucky?' Well, do ya? We're proud of our Veterans, as I'm sure you are. They are our warriors....our defenders....the protectors of our way of life, and we're grateful for their service. Dad didn't talk about it much, but his three (3) tours of duty in Vietnam and endless nights and weekends on the 'alert pad' added up to an Air Force life of duty, commitment, and service - we're proud to honor his service as well as all of our customers who have served our country.